The German Shepherd Dog National Council has consistently introduced schemes, which have been intended to improve the standard of breeding German Shepherd Dogs in Australia. the Breed Survey, Elbow x-ray and Haemophilia A testing schemes are notable examples. In January, 1982 the Hip Dysplasia scheme was introduced to the German Shepherd Dog fraternity in Australia. Hip Dysplasia is a serious problem, found in many breeds including the German Shepherd Dog and exists when the hip joint is badly constructed, hence the need to screen animals by x-ray and only breed with animals that are certified free from this abnormality. Factors such as rate of growth, weight and exercise may affect the severity and age which this condition is seen. It is a condition that in some instances is quite easily passed by, because the dog shows no outward signs. At other times the dog clearly exhibits signs of quite severe problems. The aged, dysplastic dog can become arthritic which is a painful condition and a principal disadvantage of Hip Dysplasia. The X-ray scheme allows the National Council to gather the genetic information to assist in lowering the incidence of the problem of Hip Dysplasia in the German Shepherd Dog. It also give breeders valuable information in selecting good hip producing stock. The Scheme involves the x-raying of breeding stock at 12 months of age or older. The dog is anaesthetised & the tattoo is checked and recorded on the x-ray plate along with the dog's registered name and number. The hip is a ball and socket joint, in which the 'ball' (Femoral Head) should fit tightly into the 'socket' (Acetabulum). The plate is then read by a radiologist, scored and graded. 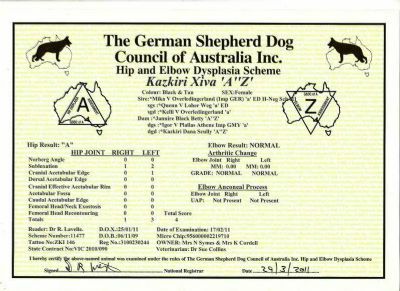 The dogs passing the Hip Scheme are given the "A" stamp. Animals which fail the Hip Scheme should not be bred with.